The PAA sports have always been one of our most popular offerings. 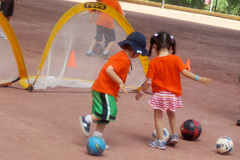 Classes are available for ages 1-6 in sports such as soccer, basketball, T-ball, and Taekwondo. Through these fun interactive sports, kids will have an outlet to release their energy while improving their social skills, coordination, and listening skills. Many of our sports classes are located outdoors at St. Catherine’s Park at 67th & 1st. If interested, please email sports@paanyc.org for a schedule and more information.